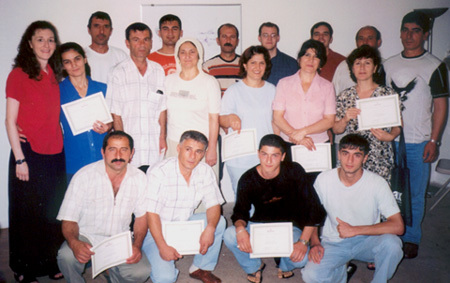 I have never seen a refugee group who was so dedicated as a whole to learning English as the Meskhetian Turks. From the first day, all of the families had begun to use language dictionaries to label items in their home. Many would carry around small scraps of paper to write down words they would see or hear. Over time, the Turks have been speaking more and more English with each other to practice, even greeting their families fresh of the plane with a "Welcome. How are you?" Many of the Turks have stressed to me that they see learning English as their key to making in America and being able to deal with problems on their own. This willingness to learn has been a joy for the English teachers at World Relief. A local apartment complex where the Turks live donated an apartment to use as a classroom, and most of the adults have had the opportunity to attend. In their ESL course, they prepare for community interactions, shopping, job interviews, and even go on a field trip to downtown Atlanta. The Turks have made great progress in English classes as their presentations and dialogues at graduation always show.